Forget the skate park, street culture is popping an ollie in the art world. A serious collection of Supreme skate decks is being rolled out at Sotheby’s on Friday in an online auction. Featuring a total of 248 boards, it is the only complete collection of Supreme decks in the hands of a private collector. Not a single one of them, as you can imagine, has ever touched concrete. The collection spans 20 years of Supreme history, between 1998 and 2018, and includes all of the skate decks the pervasive streetwear brand has ever produced. But if you want to get your hands on one of them, you will have to buy all of them. The top estimate for the whole lot is $1.7 million. To put that figure into context, a Supreme skateboard to honor skateboard legend Mark “The Gonz” Gonzales, released in 2017, retailed for US$49, according to StockX, a live marketplace for buying and selling limited-edition sneakers, streetwear, and other goods. The deck ultimately sold for US$134. StockX collaborated on an exhibition of the Supreme archive in December ahead of the sale. The company was responsible for authenticating each deck for the show entitled Inferno at the Jason Vass gallery in Los Angeles. As you might expect from a sale hosted by Sotheby’s, the collection includes high-profile artist collaboration boards from Damien Hirst, Jeff Koons, and George Condo. 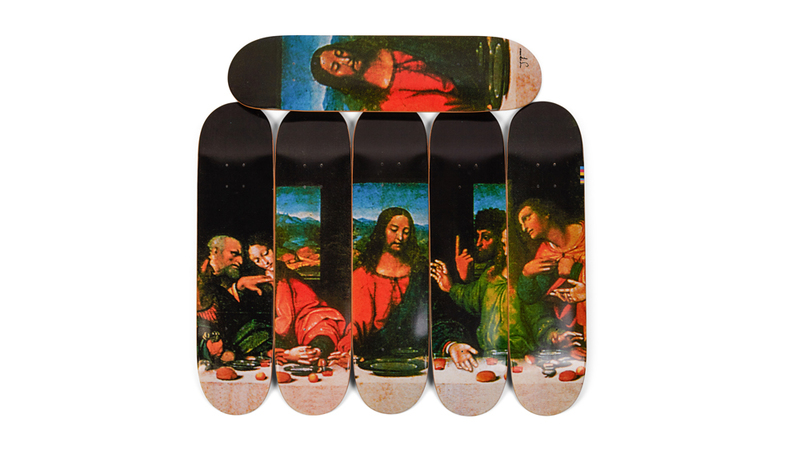 Other highlights are a series of decks that together complete a visual of Leonardo da Vinci’s The Last Supper. (The board featuring the image of Jesus was only available for purchase in Japan—one of Supreme’s most fervently devoted markets.) And, of course, the collection comes with a set of the highly visible Louis Vuitton deck triptych released in 2000, which was a precursor to the Louis Vuitton x Supreme collection that dropped in 2017 to much fanfare. That Supreme collaboration, orchestrated by then artistic director Kim Jones, also came with a Louis Vuitton skateboard trunk complete with a tool kit, trucks, wheels, and a shoulder strap (in case you were ever going to walk down the street carrying your board in a little LV-monogrammed box), all of which are included in the archive offered by Sotheby’s. Ryan Fuller, the collector behind this massive array of decks, has been building the collection for a decade, which was a full 10 years after the brand began creating the boards, according to WWD. The collector didn’t say why he decided to sell off the collection after a decade spent acquiring it, but a promising sale appraisal probably didn’t hurt the cause. So, will a deep-pocketed skate rat want to drop at least $1.1 million (the low estimate) on an entire collection of Supreme decks? Given the brand’s obsessive following, we wouldn’t bet against it.